Another month from 2015 is officially in the past! I’m both excited and super anxious about that. 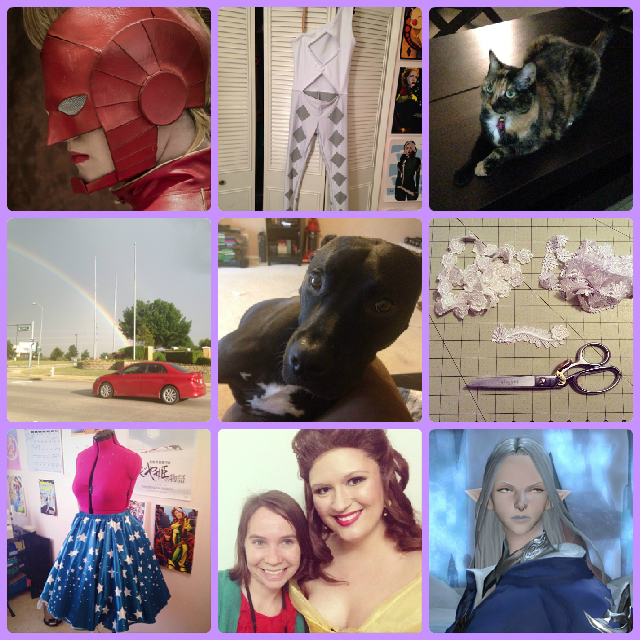 We’re now about 2 months out from some of the big cons in the Dallas area, but that means I only have 2 months to finish up costumes for myself and others! I’m going to binge watch ALL THE SHOWS and sew like a demon this weekend :P.
1. Texas (my part of it, anyway) got its last winter freak out this year a little late. We got a full 4″ of legit snow in March! Winter for us is normally a few days of ice, so real snow is a special treat. Thor loved it! Once he got used to stepping on it, he started sprinting circles around the yard nonstop. 2. 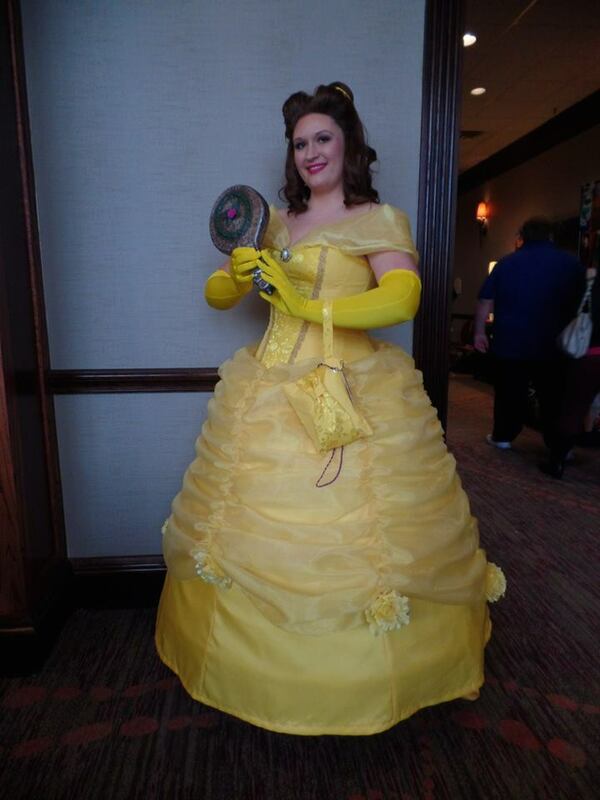 I finished Belle in time for All-Con! It’s definitely not perfect, but I’m very pleased with how it turned out. 3. 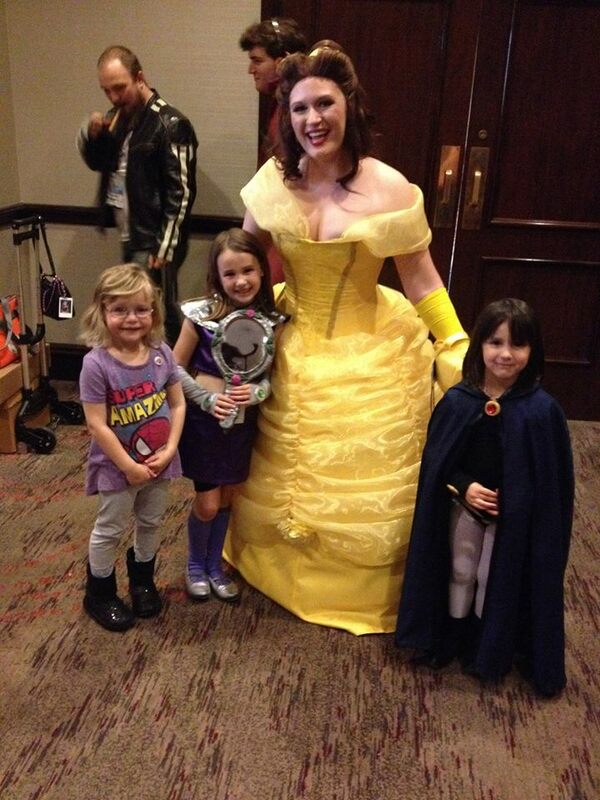 Speaking of All-Con, I definitely enjoyed it more than last year. 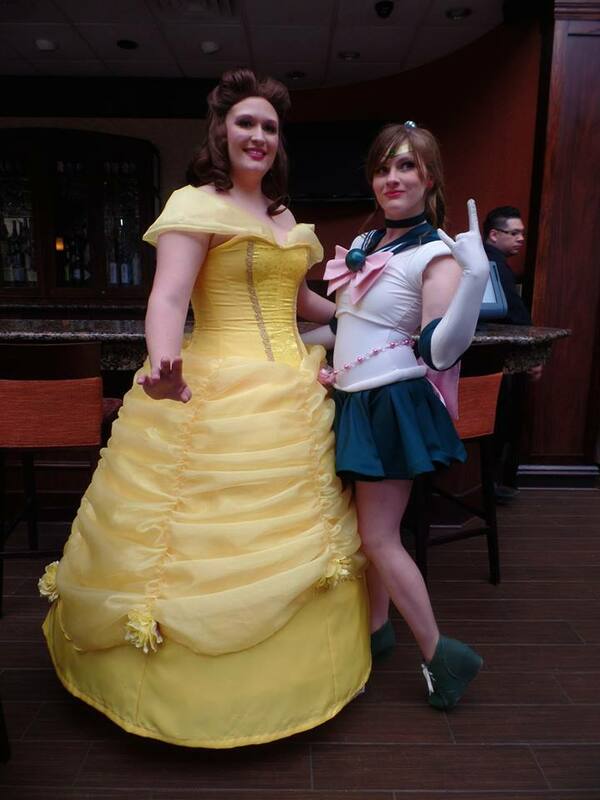 Having con friends makes a huge difference, especially at chill cons like this one. Also, Calliopunk and I are now making this a thing for ALL of our costumes (but especially when we get around to doing Rat Queens). 4. I made a couple of improvements to my craft room this month, including installing a curtain rod above my craft table to hold my butcher/tracing paper. It makes drafting and tracing so much more convenient. 5. I finally snagged an embroidery machine! This was definitely a “treat yo-self” indulgence after I got my tax refund 😛 It’s a Brother SE400 combo sewing/embroidery machine. 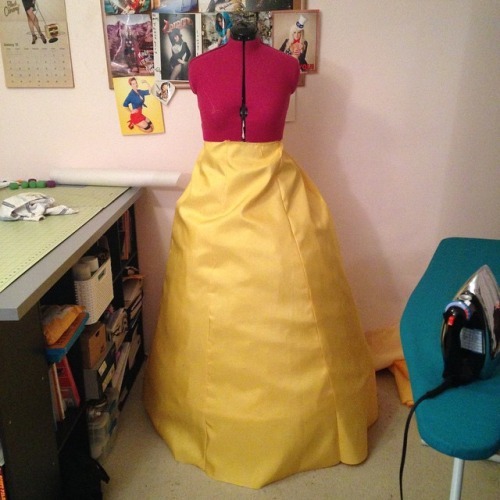 I like the idea of having it available as a backup sewing machine if my Singer Stylist flukes out on me at some point. Hopefully I’ll get time to play with for more than 10 minutes soon! 6. Last week, I travelled to Portland for the Association of College and Research Libraries Conference. The trip was a blast and I learned so much. I don’t talk about it much online, but I struggle with my desire (or lack thereof) to stay in my current profession. I don’t know if it’s burnout or what. I’ve been working in this field for about a decade, and now that I’m approaching 30, I’m wondering what the next step is for me. Work conferences are a good way to get excited about my career again, and ACRL is one of the best conferences I’ve attended in years. Plus, meeting G. Willow Wilson (the writer for Ms. Marvel) is basically the highlight of my nerdy life at the moment. I’m just kicking myself for not getting photos of the cherry blossoms while I was in Portland! Are you on Instagram? Let’s be friends! I feel so old every time I say this, but I feel like 2015 got off with a ridiculous flurry. How did the month go by so fast? 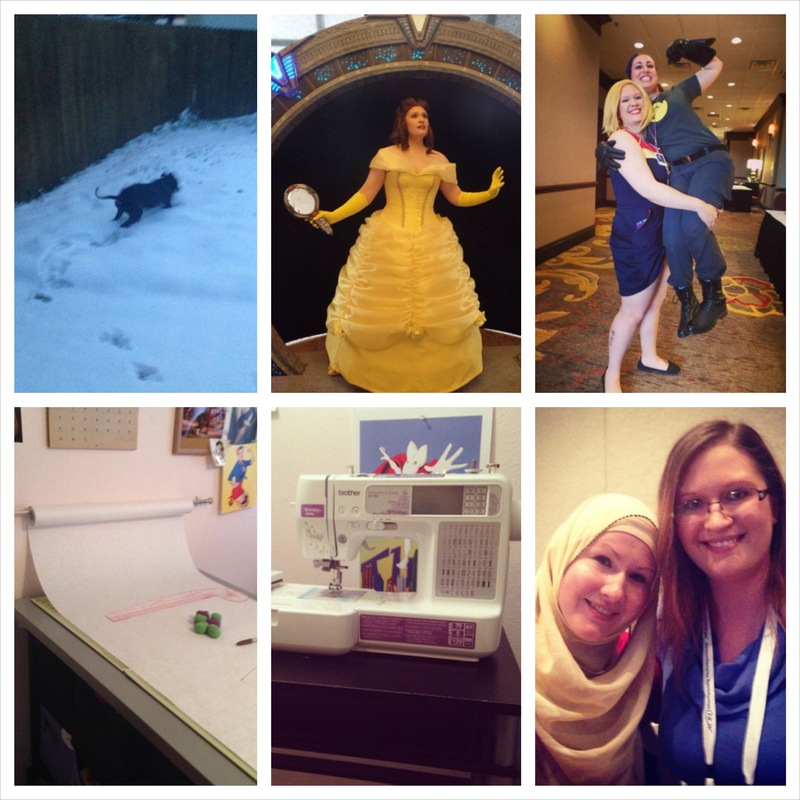 Here are a few of my favorite moments from January, as documented by Instagram. My birthday was on January 4! 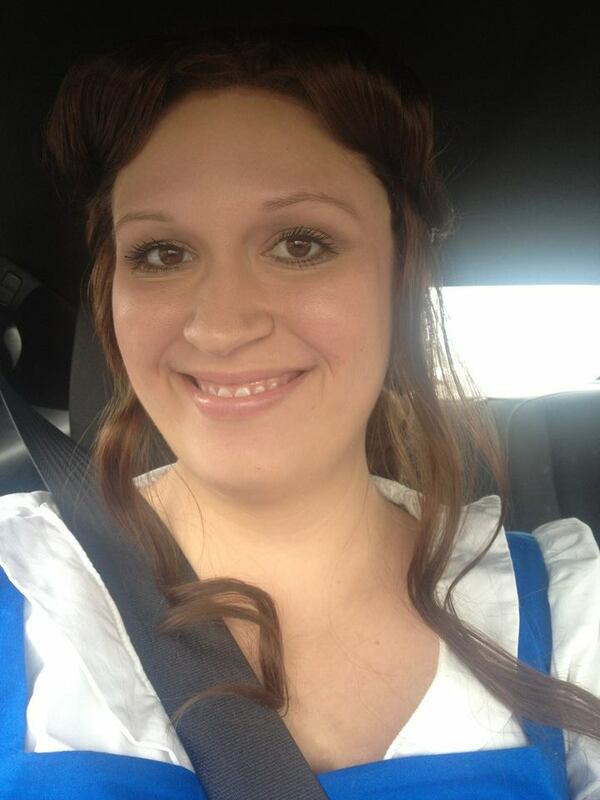 I was unfortunately too sick to go out and do much of anything fun. 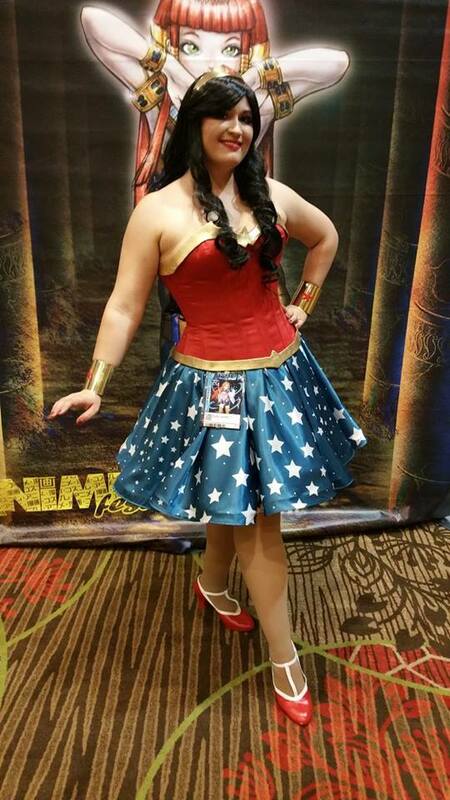 But my friend Maven Lee Cosplay still made me this beautiful cross-stitch! It’s currently hanging by my sewing table. I started my Back to Basics series! I have lots of ideas for this series, and hopefully I’ll be able to pump these out once a month. The next one should be ready for posting next Tuesday! 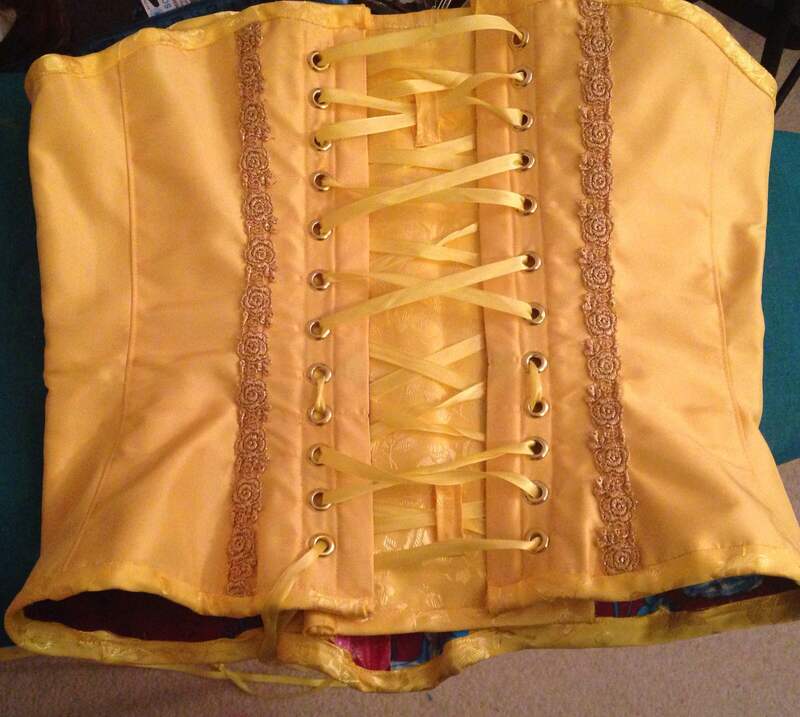 I finished waaaaaay more commissions than I anticipated this month: 2 bodysuits for Taffeta Darling, a cape for Chaks Productions, and a bustle skirt for a friend’s upcoming steampunk costume. I thought is was funny looking at TD’s bodysuits next to mine, since I’m stupid tall and she’s on the shorter side. There’s like 8″ of difference between the legs of our suits. My puppy continues to distract me from crafting. He’s not a fan of me isolating myself to work on projects, so most of the time I have to wait for my boyfriend to get home before I can start on stuff. How do you handle craft pets? ModCloth asked me to participate in their layering challenge. It was super exciting to be contacted by a company that puts out so many cute clothes. 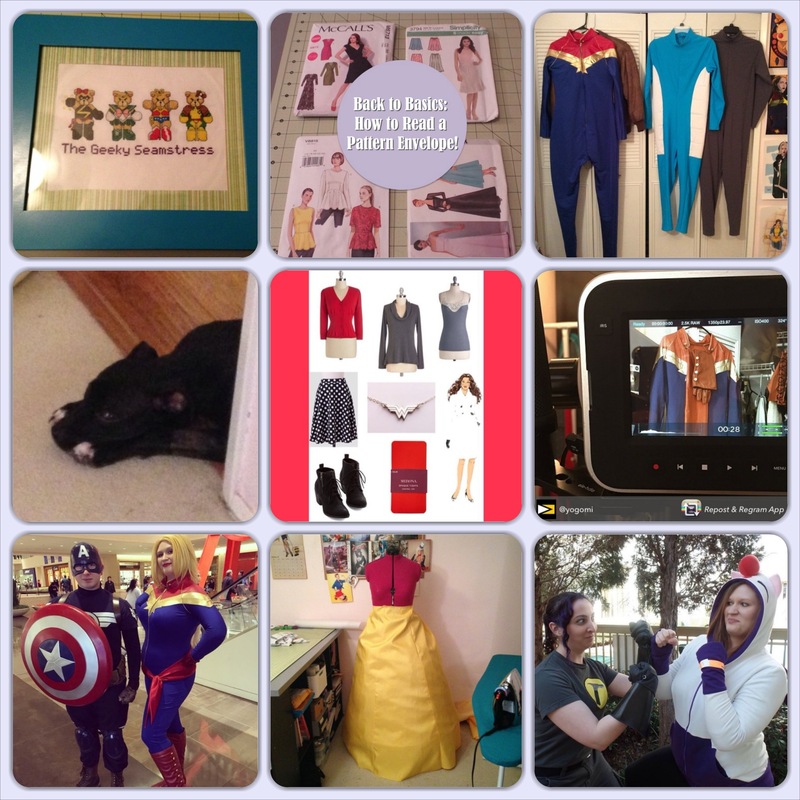 The mood board/fashion styling post was kind of a first too! Are you guys interested in seeing more of these posts? 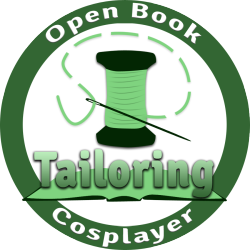 My friend Yogomi contacted me about creating a cosplay documentary series. 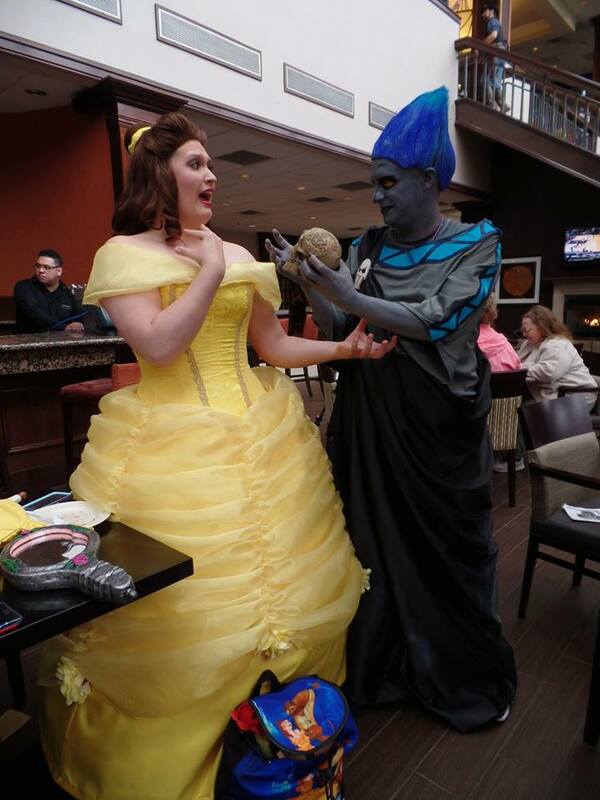 He’s doing short, 10-ish minute segments on various cosplayers and chatting about what got them into cosplay, their inspiration, how they go about projects, etc. I’m super excited to share this with you guys once it’s up! I got to do my first promo gig! 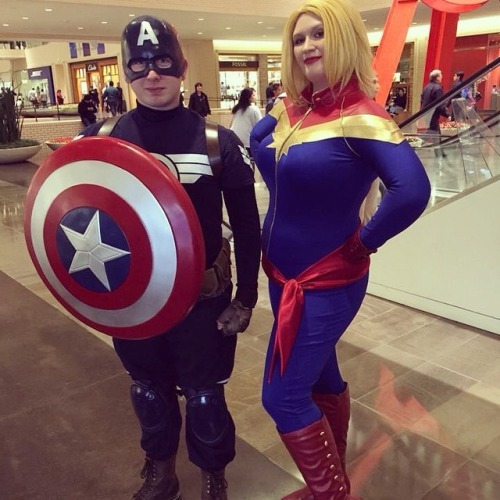 Red Pegasus put out a call for Marvel cosplayers to help promote The Marvel Experience (Gone Catawampus has a great review of the event if you’re interested in attending!). 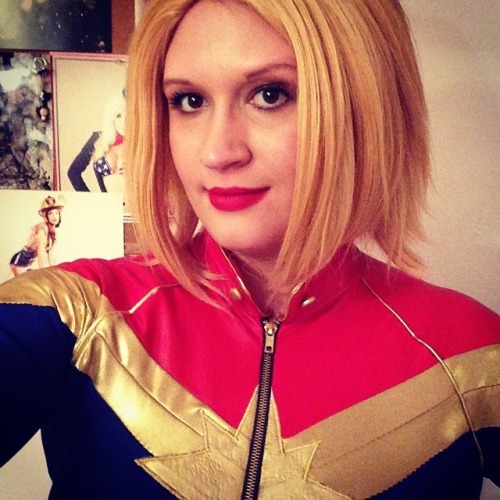 I donned Captain Marvel for the event. Promo work isn’t something I think I’ll do on a regular basis, but it was fun nonetheless. And I got free tickets to attend The Marvel Experience, so win! 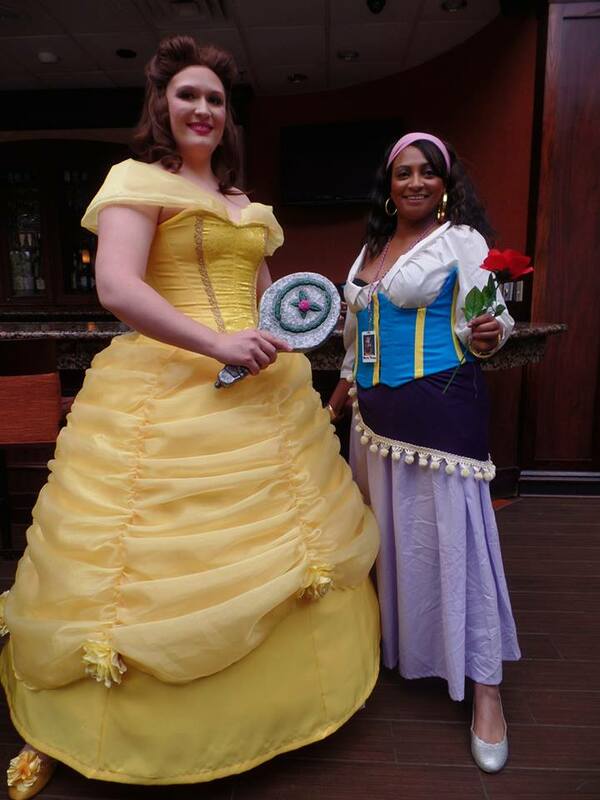 Calliopunk/Callulu Cosplay persuaded me to tackle Belle. 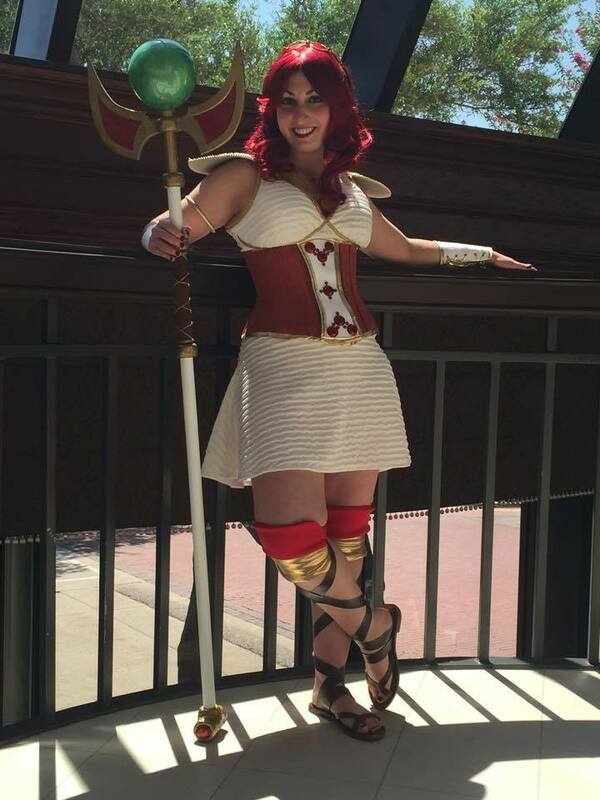 As I mentioned in my last post, I’m hoping to have her ready for All-Con in mid-March. 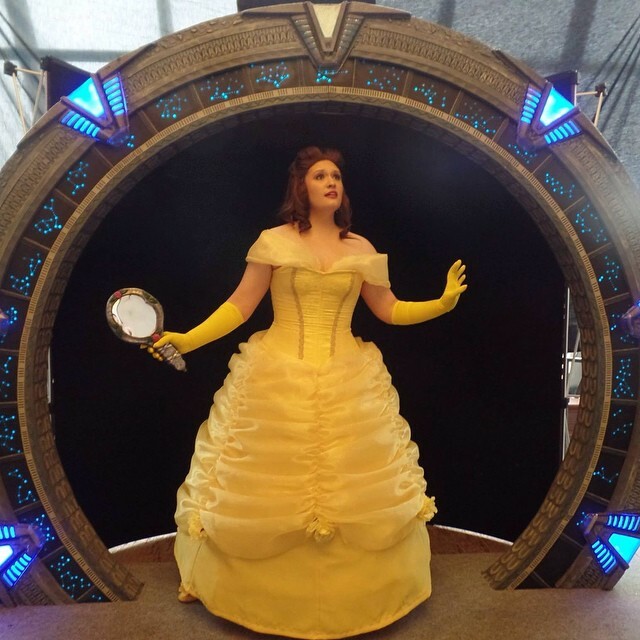 Once Fan Days is over, I plan to focus entirely on this costume (and finally make 1 or 2 non-costume things. I need an instant gratification project something fierce). 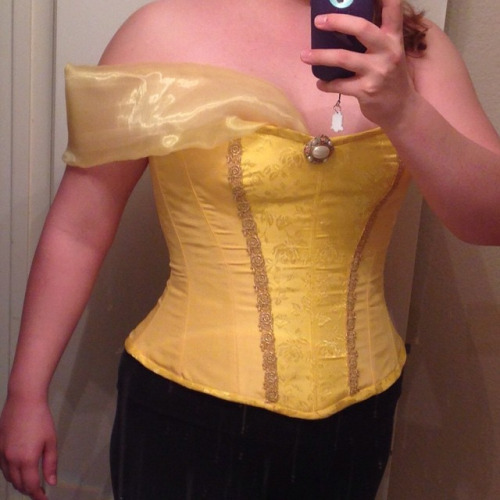 Hopefully I’ll have some time this week to get started on the top layer of her skirt! 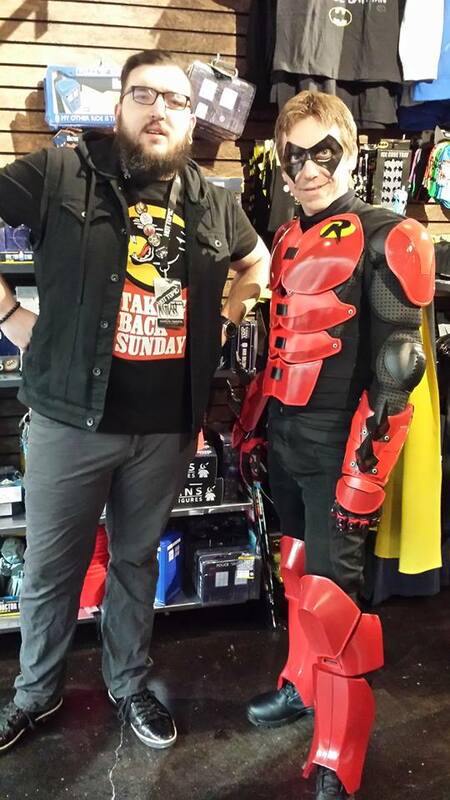 I made it out to the North Texas Comic Book Show a few weeks ago. This is always a low-key event, but it’s nice to actually be able to talk to people instead of hastily waving at friends while rushing between panels and events. My favorite photo from the day was me in my moogle hoodie “fighting” Calliopunk in her Captain Hammer. 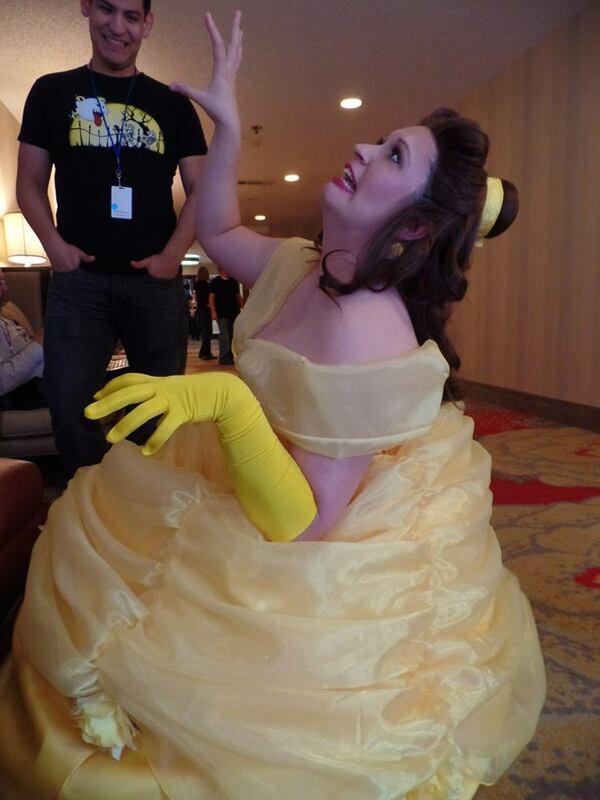 This photo blew up my tumblr feed. Uh, okay then. Gah, I’m so excited for this! I nearly finished Captain Marvel at the end of December for a charity event, then I wound up getting the flu and couldn’t go 😦 This has definitely been the most intense bodysuit I’ve made to date. 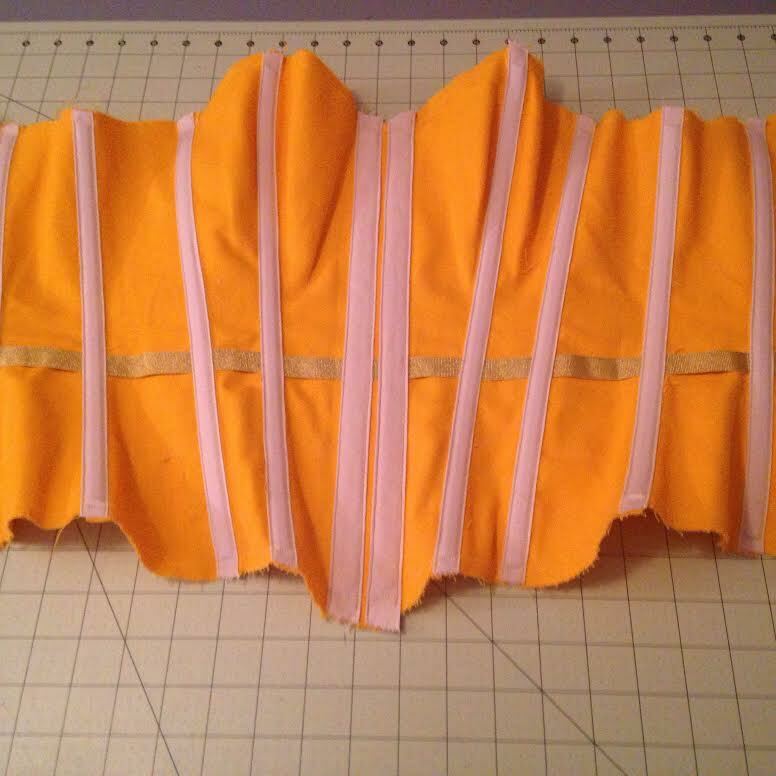 The bodysuit alone took close to 20 hours with all the seam matching, flat piping, and satin stitching. 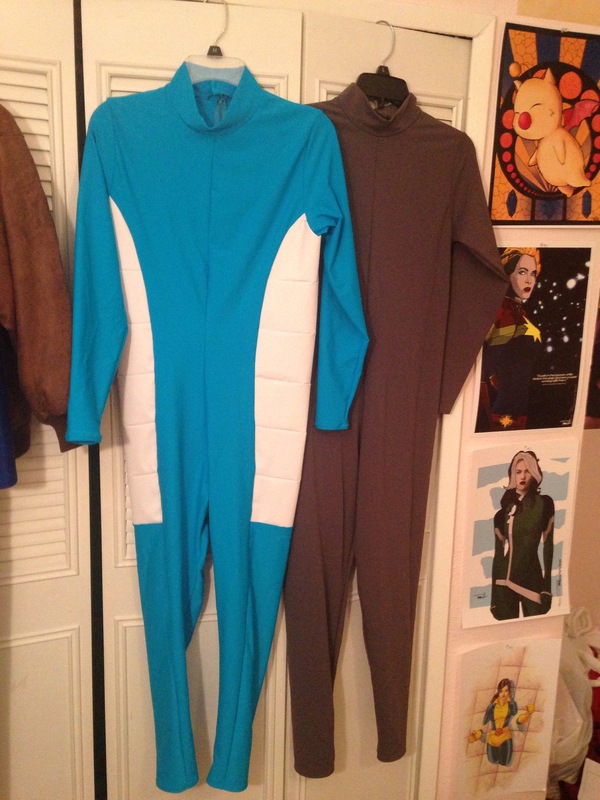 I have a couple of different “looks” planned for Carol depending on weather and what cons I attend. 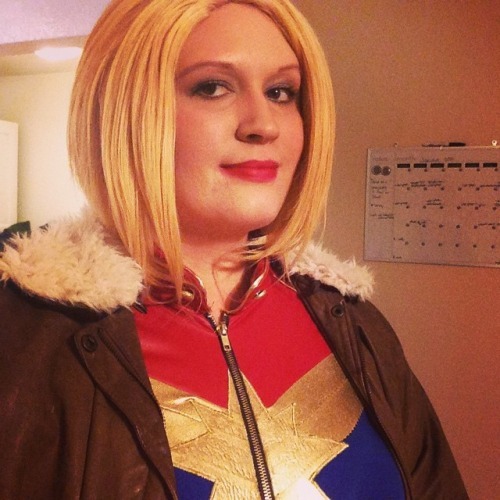 For a more casual look, I altered an old bomber jacket and bought a lacefront alternative wig that matches Carol’s current hairstyle during Epic Cosplay‘s Black Friday sale. 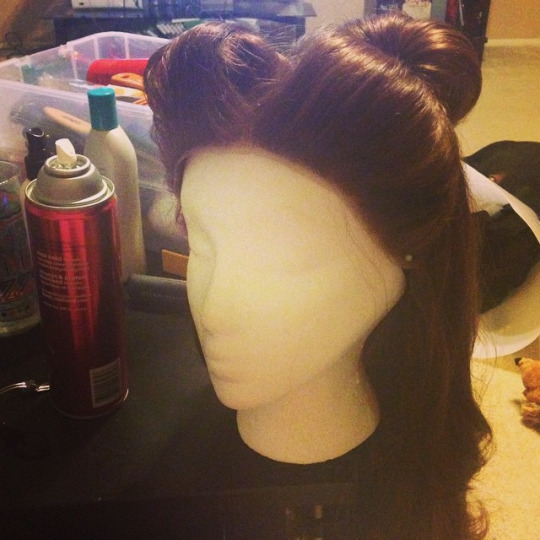 I was hoping to style this wig into a faux hawk, but Epic wigs don’t hold intense styling very well. For the cons I that I want to go all out, I have a helmet in the works and flame fists (made using BelleChere’s fabulous tutorial!). I just got a Lulu from Arda that I’ll style into her mohawk with the helmet. All that’s left on this costume is finishing the flames, picking up my hip ornament and helmet, styling the wig, and adding buttons to the gloves. If you follow my social media, you already know that my new puppy got into my craft room and destroyed my original gloves. That dog is lucky he’s cute. Fortunately, he’s okay and didn’t do much damage otherwise. I can’t wait to share the final results with you guys! 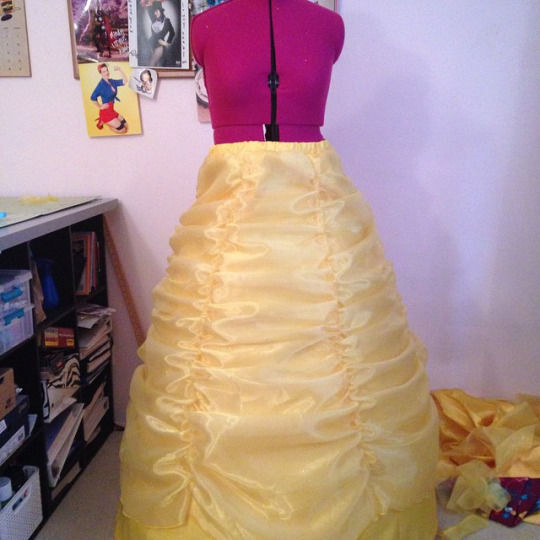 My friend Calliopunk over at Gone Catawampus convinced me to tackle Belle’s yellow ballgown. After some thought, I decided to switch up my lineup and tackle her for All-Con in March. 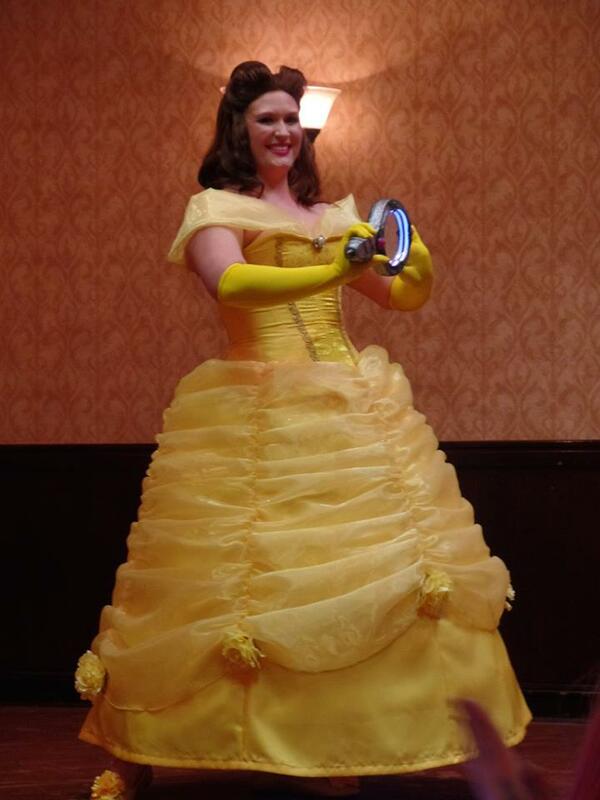 Fortunately, I have a bit of a break on commissions this month, so I’m clearing out my calendar and focusing on Belle for the next several weeks. Taking this project on does mean that my coat project is going on hold, but that actually works out for the best since it’s been in the 60s-70s here for the past few weeks. My fabric will still be there in the fall! 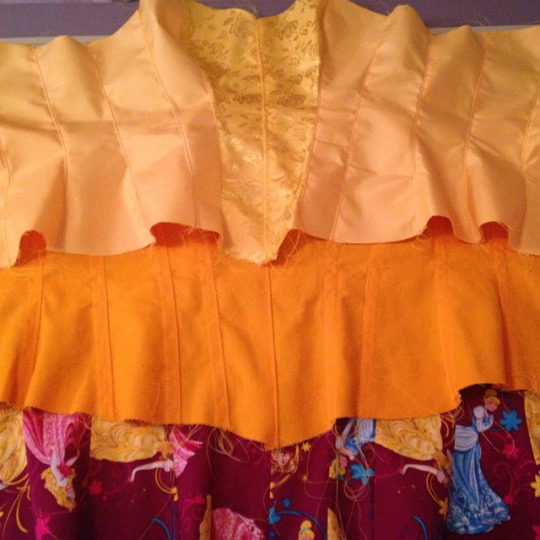 I decided to go with the animated film version with some fabric tweaks to give it more visual interest. Keep an eye out on my Instagram for lots of updates! These were made for the lovely Taffeta Darling. 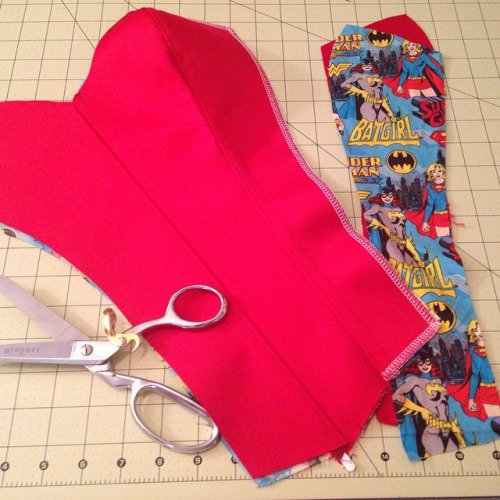 The grey one is for Squirrel Girl and is made using Kwik Sew 3052 and matte gunmetal moleskin. The blue and white one is for Captain Cold. It’s made from turquoise milliskin (sadly, no moleskin in the right color) and white stretch vinyl. 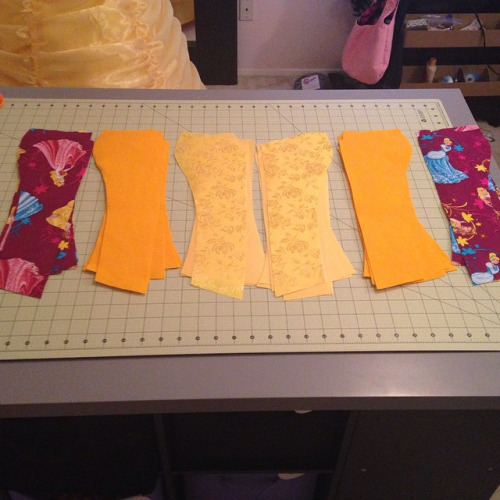 To make the side panels, I made a mock-up of Kwik Sew 3052 and marked out the sections while my client was wearing it. Then, I just transferred those markings to my paper pattern. I’m pretty pleased with this one, and it was great practice for an upcoming Stephanie Brown Batgirl commission! This was a quickie day project. 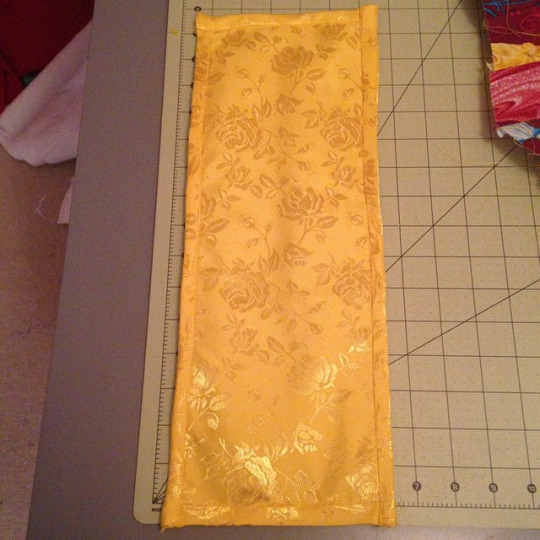 Basically, it’s a black and yellow cape for Chaks Productions made of broadcloth. It attaches to his suit with velcro. Yay capes! This photo is pilfered from his page. 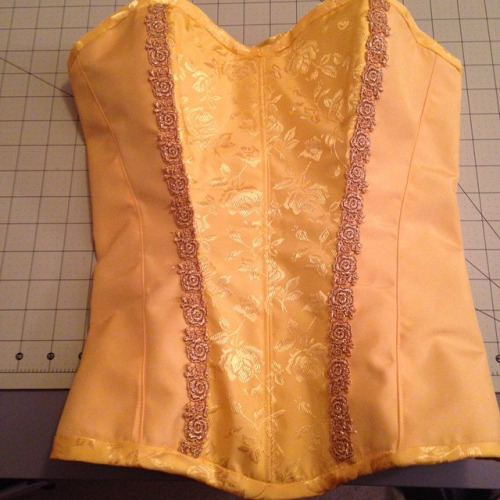 Ah, the lovely Simplicity 1819. 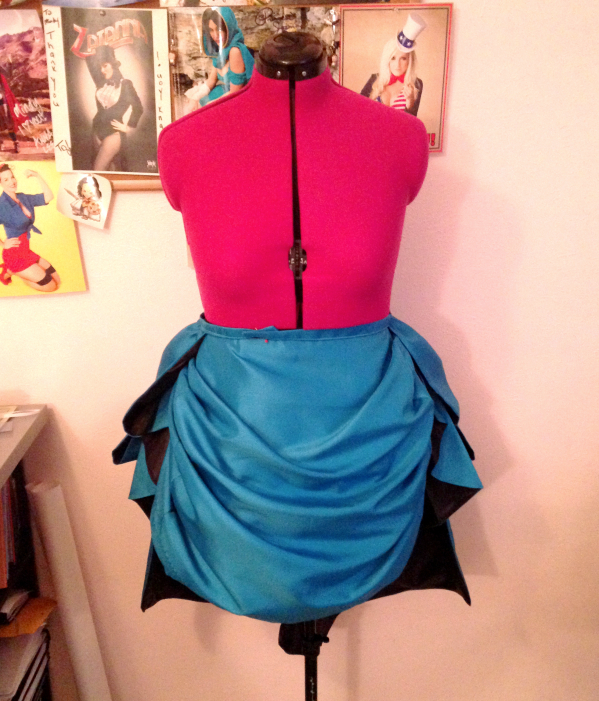 I definitely griped about this skirt a lot in my last post, but it wasn’t too bad of a project!